WagonR is one of the most renowned hatchbacks of the Indian market and it has been on sale in India for the last 7 years. There were talks that Maruti Suzuki could launch the new generation hatchback in India soon and some images of the leaked hatchback were doing rounds on the internet too recently. However that is not the case Maruti has decided not to introduce the new generation hatchback now and instead will actually launch the updated car in a new avatar. Now before we go into any other details let us inform you that Maruti has decided to retire the Stingray nameplate from their lineup and merge the Stingray variant which until now was offered as the top variant with the entire lineup. So in short the Stingray variant of the WagonR is the standard model now. What is even more interesting is also the fact that a new top VXI+ trim has also been added to the lineup now which will receive all the bells and whistles. The new Wagon R is bigger in size and had a longer wheelbase as compared to its predecessor. No marks for noticing that it resembles the outgoing Wagon R to a large extent. Engine room is larger than the older version, to ensure that the K Series engine fits in comfortably. Labeled as the “Blue Eyes Boy” by Maruti, the blue parking lights do justice to the name. Headlamps give the front a distinct shape. Fog lights are part of the standard equipment. From the side profile, the new WagonR looks like a stretched version of the old model. Longer wheelbase give you that extra space to stretch your legs.Rear wiper and defogger are standard again. A big plus point, considering that the more expensive Swift and Ritz VDi cant afford them. Rear tail lamps looks simple get stylish and the chrome plate with Wagon R embossed steals the show as far as the boot is concerned. In all, the Wagon R has grown up.Compare it to the competition! The Wagon R’s design looks boring in front of the Chevrolet Beat. The space will be the selling point. The front and the rear seats will have ample of head room and knee room. There shall be no compromise on the space front. This time we reckon even the boot shall be larger. There shall be more comfort on offer. The Wagon R will have dual airbags and ABS as a standard feature. There will integrated 2 DIN system with bluetooth, aux and USB. Steering audio controls, reverse sensors and even keyless entry will be offered too. The steering wheel will be shared with the Ignis. It is the engine which has received the major upgrade and is the reason why Maruti Suzuki has launched a revamped model. Maruti Suzuki Wagon R is now available with new KB-Series MPFI petrol engine that delivers power of 68 PS @ 6200 RPM and maximum torque of 90 Nm @ 3500 RPM. This engine is the same as can be found in both the A-Star and the Zen Estillo. The car features 5-speed manual transmission and seating capacity for 5 people.Maruti Suzuki’s claims its new engine delivers mileage of 18.5 kmpl as per the ARAI ratings. The model is also available with ABS, airbags and EBD as optional features. The engine now conforms to the latest emission norms. The new series engine gives a feel of driving a compact A-star model. The 5-speed manual transmission is now geared with cables as opposed to linkage which means better driveability and better performance from the new 3-cylinder engine. The big windscreen is definitely welcome in the new model and gives a better road view. The suspensions have also improved which gives better, sweat-free smooth ride. You may find the car a little bumpy around sharp corners. Something that is not felt while driving Hyundai Santro which is more manageable even with its tall stance. As far as ride and handling is concerned, the new WagonR has a new-found feeling of stability that was missing in the previous car. But make no mistake, with a body that soars into the sky the new WagonR feels significantly top-heavy. Though there is body roll, it feels more planted than before and you don’t get the feeling it’s going to keel over. Also, the electrically assisted power steering feels a touch too light and lifeless around the straight-ahead position at high speeds. The soft suspension is great for low speeds but has a tendency to pitch, especially at the rear on uneven surfaces.This car has been designed to thrive in the urban environment, which it does. At low speeds, the ride is incredibly comfortable for such a small car and manoeuverability is brilliant. 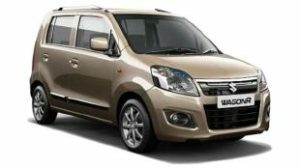 Good visibility from its high stance and the compact proportions give you confidence to slot the WagonR through gaps you would hesitate to grab in other cars.